Did you know about courthouse dogs? Not drug sniffers or law enforcement canines, but dogs that work with defendants and witnesses who need the support of a friendly, assistance-trained dog. They are just one of the many groups who work in American courthouses, and their history and examples of their use are found in A Lawyers Primer for Writers. This is an indispensable guide for those who want to set scenes in, particularly, the American legal system. Are all defense attorneys unlikeable? How are trials prepared for? What are the steps of a trial? Are breath tests accurate? Can the police lie to you? What are the top five mistakes writers make at a crime scene? Can you trust the source? Shaun Kaufman has worked in the criminal justice system for 30 years. 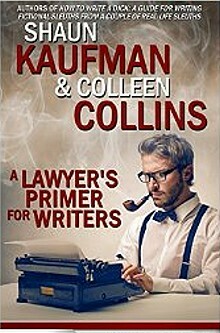 Colleen Collins is an author of other writing books and together the authors co-owned a private investigations agency where they specialized in legal investigations. It's all good meat for the writing process. Information in this book isn't just excellent for fact checking, it's a launch point for ideas for your next story. Written in a clear, concise, layperson's style, the Lawyer's Primer is highly accessible and a very enjoyable read. It winds up with a dozen films to watch and tips on whether liberties were taken for dramatic effect. Get it. Read it. Run with it.